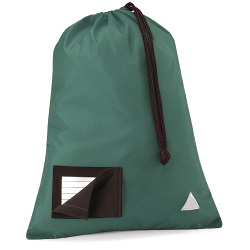 210D Nylon school pump bags in various colours with reflective triangle both sides and name card with flap to front. All of our school pump bags are available embroidered from 50 bags or printed from 25 bags with your school logo, price upon request. Bottle Green School Pump Bags Sold per bag Bag size 280x380mm Drawstring Top ..
Burgundy School Pump Bags Sold per bag Bag size 280x380mm Drawstring Top ..
Navy School Pump Bags Sold per bag Bag size 280x380mm Drawstring Top Na..
Red School Pump Bags Sold per bag Bag size 280x380mm Drawstring Top Red..
Royal Blue School Pump Bags Sold per bag Bag size 280x380mm Drawstring Top ..